A day in the life of a crazed hockey fan begins almost always the same. There is an air of excitement that can be felt across the city throughout the day. The city turns blue and green everywhere you look. Game day has over taken the city. Jerseys and teams colours are being worn by everyone. Local media from the radio, to the newspapers are making predictions for the big game and the production of certain players beyond the coming evening’s game. Fans all around the city are buzzing with excitement as they make their own predictions over the impending game and their favourite players. Every where you go people are discussing not just the game but the season to come. All around town whether it is at home, on the bus, walking down the street, at work or out for a bite…the game is being discussed. Some people cannot wait while others find the whole sport and the insanity it brings, ridiculous. Pre-game shows begin on the radio and T.V. to further analyze the game that has yet to happen and any incidents or story lines they think might relate to the impending game. [Personally, I like to skip pre-game shows as they usually make me irritable with their inane commentaries.] Game time dawns but that doesn’t mean the puck drops right away. There is the pre-game warm-ups for both teams and all the fans racing for the best spot closest to the ice to view their favourite players. Then, there are the anthems and any previously scheduled pre-game ceremonies that take place. The lights go out in the arena and suddenly the team logo on the ice is in the spotlight. The horn goes off as the players are announced and skate onto the ice for the anthems and ceremonial puck drop.The entire arena is engulfed in silence as the crowd anticipates the coming anthem and outcome of the game. The anthems begin and an echo of the entire crowd singing in unison gets louder with each line. The excitement is palpable. The puck drops. The home team wins the draw. The crowd begins to cheer as one as the players race down the ice. The whistle blows. The puck is offside. Play begins again and there rushes back and forth as the crowd oohs and aahs. Close calls on both sides. Just as it looks like the home team might score, the whistle blows again. A penalty is being called against the home team. The crowd sends out a round of boos to very loudly to let the refs know they got the call wrong[even if they were right…!]. The crowd is on the edge of their seats as the visiting team spends an entire two minutes of the powerplay in the offensive zone swarming for that elusive first goal only to be denied by impeccable goal-tending and defensive maneuvers by the penalty killers. Each save and block is met with loud cheers for the home team. The home team kills the penalty and the cheers are deafening as the penalized player exits the penalty box and steals the puck for a breakaway. SCORES!!!!!!!!!!!!!!!!!!!!!!!!!!!!!!!!!! Goal celebrations ensue on the ice and those deafening cheers…well lets just say they reach a whole new level. Lines change and the resumes. Action goes back and forth amid cheers from the home crowd or boos when the opposition gets near the puck. The opposing team ties the game….met with a round of ‘terrible goal’ comments and boos from the crowd. The pace picks up as the clock winds down and the game could go either way. ONE minute left in the third period and the game is still tied. Over time seems inevitable. The away team ices the puck…play moves into their end for one last draw….the puck drops and the home team wins the draw back to the point. The defenseman on the point passes cross ice down to the winger on the side of the net who fakes a shot and blindly passes the puck to the forward screening the front of the net who with a quick backhand dekes it in the net just as the buzzer sounds….SCORES!!!!!!!!!!!!!!!!! PANDEMONIUM ensues as the the crowd jumps from their seats erupting in cheers and applause as the team leaps from the bench surrounding the goal scorer. The away team skates away heads hung low in disbelief at the over time opportunity lost at final seconds. The home team celebrates the winning goal…three stars are named…the goalie, a very appreciated offensive defensive forward and the game winning hero. The crowd waits to file out as the players are interviewed. After the interviews are over the crowd files out of their seats and make their way through the arena…the home victory is feeding everyone’s mood…people are high-fiving all the way to their cars and public transit and everyone cannot stop talking about that last second goal.The feeling of victory is felt all throughout the city. The day in the life of one crazed hockey fan is one full of endless possibilities. Win or lose this fan will always support her team. Game days ending in victory or even those ending in a loss are a part of the journey when you follow any sport…but in the this current lockout through today the NHL has taken away all league wide regular season games through Nov.1st robbing the fans of any possibilities that could have been. The players and owners may be stuck at a stand still…but the fans deserve better…please, let’s get that new CBA signed & sealed so that we can all go back to our crazy game day routines! 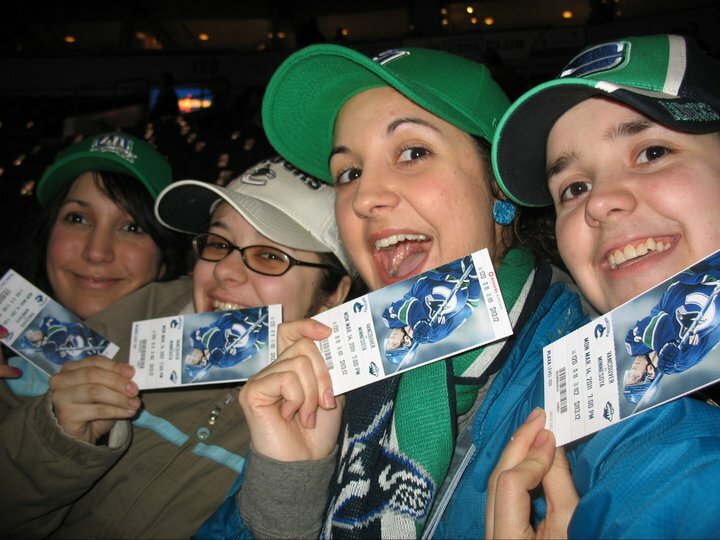 This entry was posted in Hockey, Long Reads, NHL, Vancouver Canucks and tagged hockey, NHL, regular season, sports, sports fans, Vancouver Canucks by sarahlaug. Bookmark the permalink. I agree that fans do deserve better than this. As a fellow NHL fan, I cannot express how disappointing this whole ordeal has been.